Do you recall playing with toy cars as a child, staging your own little car chases in which the vehicles would fly off of tables and bounce off of walls? Now imagine that your stubby little hands have been removed from the picture and the little cars are full-sized, yet they still continue to perform acts of such absurd vehicular derring-do that it feels as if a child made it up. Well stop imagining because that’s pretty much what you get with Fast Five, AKA Fast and Furious 5, AKA F5, AKA Refresh Web Page. 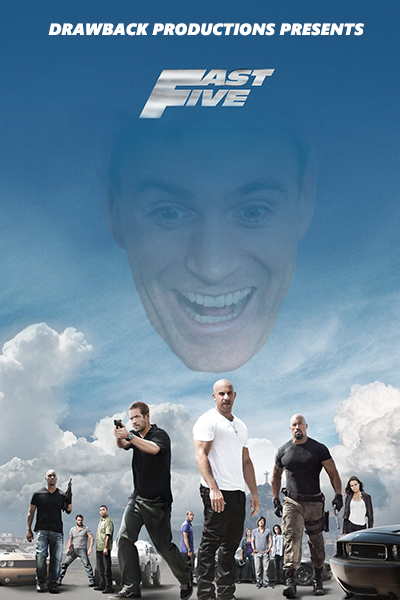 Tenacious as a cockroach, the F&F series has survived the loss and reacquisition of its hairless star, numerous rappers-turned-actors, and a little piece of fan fiction-turned-actual-movie called Tokyo Drift to become an unlikely box office BRO-hemoth. With no articles or coordinating conjunctions to slow them down, the filmmakers finally found the perfect balance of unnecessary breather scenes, obligatory drag races and a consistent distaste for the physics of planet earth. Drawback Productions (Dru Brock and his wife--the O’Conner to his Toretto--Megan) watch Vin “Pause to Seem Cool” Diesel, Duane “My father was ‘Mr. Rock’, just call me ‘The’” Johnson, and the rest of the rag-tag group of gentlemen bandits as they lay waste to countless innocent bystanders. Admire the automotive carnage as you pity the droves of Affliction-shirt-wearing dum-dums who paid money to see this crap un-ironically, then smugly pat yourself on the back for knowing how dumb this all is while secretly enjoying it anyway. 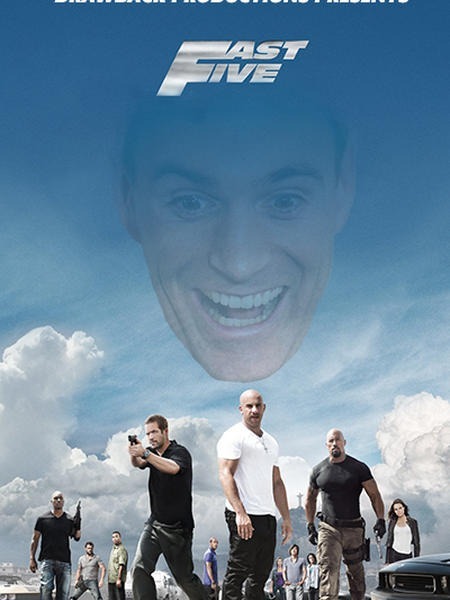 NOTE: We've riffed both the "THEATRICAL" and "EXTENDED" editions of Fast Five. The expanded edition is about a minute and a half longer than the theatrical version. That's about two more pointless scenes and a solid twelve seconds of additional CG blood splatter. DOUBLE NOTE: In a transparent attempt to assuage my guilt, $1 for every sale of this riff will go to Reach Out Worldwide disaster relief (Paul Walker's charity organization). TRIPLE NOTE: Included is a free riff for Birds of a Feather, a Season 2 episode of Highway to Heaven that guest-stars Paul Walker. The video is here: http://www.youtube.com/watch?v=IRzPHqZtNTg Enjoy!